Japan is composed of four main islands: Hokkaido, Honshu, Shikoku, and Kyushu. Along the Inland Sea west of Kobe on Honshu Island is the city of Akashi. A narrow strait (the Akashi Kaikyo) separates Akashi from Awaji Island. When the Japanese economy was booming in the 1980s, the government decided to build a highway system to connect quiet Shikoku with booming Honshu. One Golden Week many years ago, I boarded a ferry from Tokyo to Shikoku Island. It took a day to reach Tokushima on the northeast side of Shikoku. Today, one can drive and its about 350 miles. 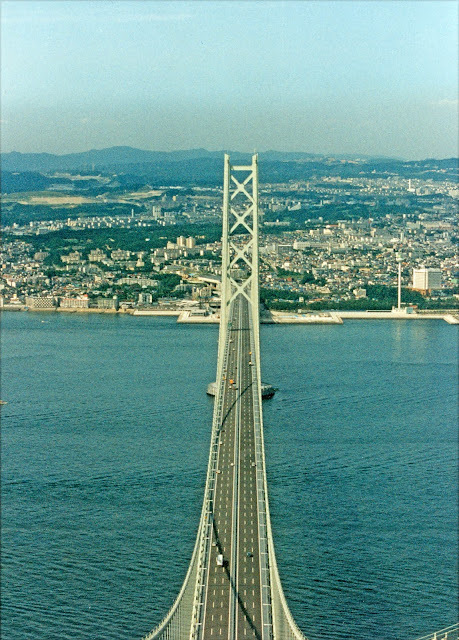 In this photo, I'm standing atop the southern tower of the Akashi-Kaikyo Bridge looking north at Akashi. Actually, its a fairly clear day, since we can see a considerable distance before the brown smog appears on the horizon. To the right of the bridge is a tower that was put up to allow the public to view the construction of this bridge. Japanese engineers are quite adept at conducting effective publicity campaigns for their new bridges, which include viewing platforms and parks where families can learn about the bridge. Since the toll for crossing the Akashi-Kaikyo Bridge (also called the Pearl Bridge) is $20 U.S. (2300 Yen), this makes good sense. Also, bridges are considered beautiful objects in Japan. Landscapes showing river crossings are one of the favorite subjects in Japanese art. Honshu-Shikoku Bridges: Akashi-Kaikyo Bridge (2) by Mark Yashinsky is licensed under a Creative Commons Attribution-NonCommercial-ShareAlike 3.0 United States License.